On January 10th, “Feral Creatures” curator Stefanie Chefas will bring a new crop of artists to Modern Eden Gallery with “Platinum Blend”. The title refers to each artist’s ability to ‘blend’ different styles in a way that feels consistent throughout their careers, and amongst eachother. 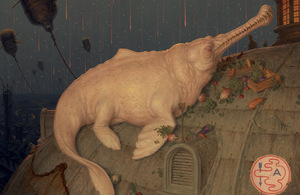 This includes artists Mel Kadel, Jana Brike, Deedee Cheriel, Brian Donnelly, Christine Wu, Zoë Williams, and Henrik Aa. Uldalen, featured here. They are joined by Aaron Nagel, Ben Venom, Bradley Platz, Caitlin Hackett, Caleb Hahne, Candice Tripp, Christiana Mrozik, Cristina Paulos, Cyrcle, David Bray, Jeff Ramirez, and more. 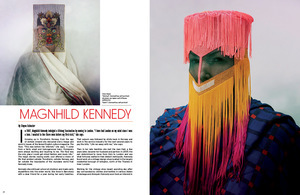 While their styles are visually eclectic, their concepts are equally surreal and play with abstraction. 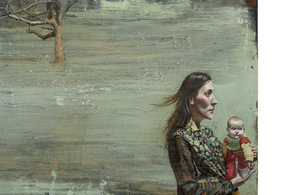 Brian Donnelly’s portrait of a little girl, for example, starts at the top with realistic detail, only to be deconstructed by dripping paint. Christine Wu also deconstructs her figure, but in a way to suggest her movement around the scene. Take a look at some of the work in the show below.